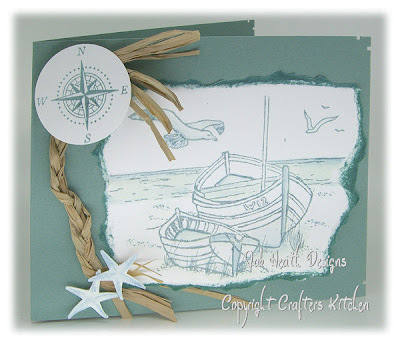 I Punched out a couple ofstar fish with craft punches and coloured with watercolour pencils the compass is from the Father knows best Stamp set by PTI. Love this card Jak. So simple but so beautiful. I love this card Jak, the colours are gorgeous and it's simple yet beautiful, well done yet again! Love it Jak. I would never have thought to add the rafia like that! You truly are an inspiration. Thank you. Love anything to do with the seaside. Colour restful. Absolutely love it Jak, i just love the colour used.